A photograph of a red sticker notice on the window of 147 Hereford Street, indicating that the building is unsafe to enter. A photograph of a red sticker taped to the Government Life building in Cathedral Square, indicating that the building is unsafe to enter. 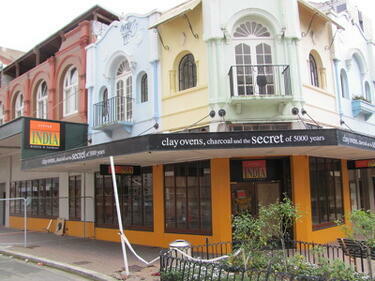 A photograph of the Little India building on the corner of Gloucester Street and New Regent Street. One of the doors has been boarded up with plywood. 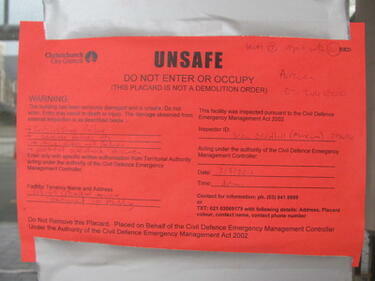 USAR codes and a red sticker can be seen on the other. 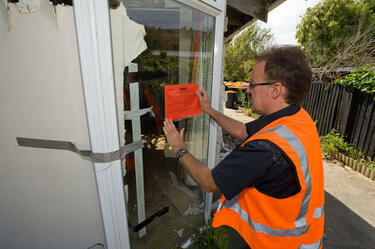 A Civil Defence staff member placing a red sticker on the window of a damaged house. The sticker indicates that the building is unsafe to enter. A red sticker on the window of a damaged house. The sticker indicates that the building is unsafe to enter. 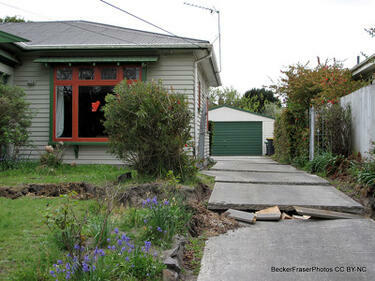 A damaged house in the Christchurch central city. Codes have been spray painted on the driveway as well as "No go" on the front window and door. A red sticker in the front window indicates that the building is unsafe to enter. 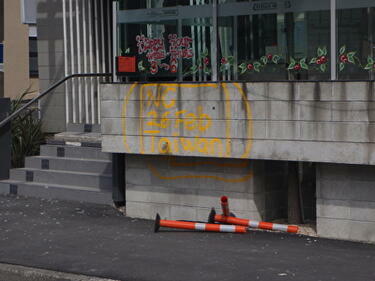 A photograph of USAR codes spray-painted on Grenadier House on Madras Street. A red sticker taped to the glass above indicates that the building is unsafe to enter. The door of a house on Main Road in Redcliffs. 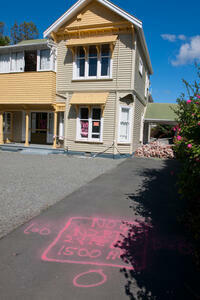 The house has been red-stickered due to rock fall danger. It has a sticker on it reading, 'Danger, live wires'. 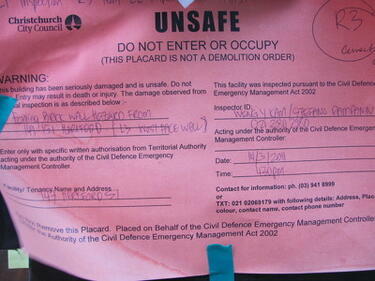 A 'Landslide and rock fall' factsheet has been taped to the door. The factsheet is produced by CERA. 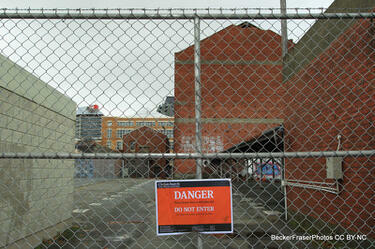 A sign on the fence surrounding an empty site between St Asaph Street and Tuam Street. 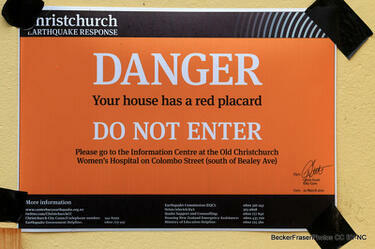 The sign reads, "Danger, your house has a red placard, do not enter". A sticker on the door of 18 Cranmer Square. The sticker reads, "Danger, your house has a red placard, do not enter". A video of an interview with Andy Cole, site supervisor at Geovert, about the procedure for blasting rocks in Hillsborough. 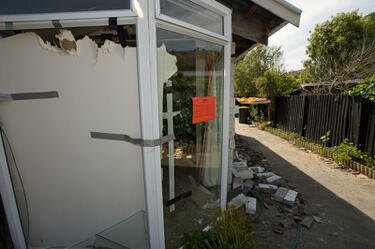 The rock-blasting work was paid for by two Christchurch couples whose properties were red-zoned and red-stickered. The couples hope that the blasting work will encourage CERA to change their land zoning from red to green, allowing them to rebuild their homes on the same sites. 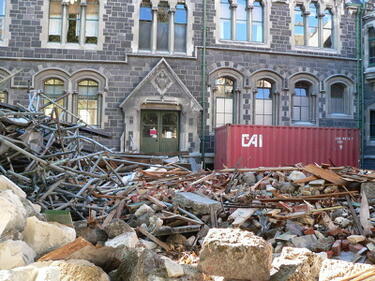 A photograph of the rubble of the Observatory tower in the South Quad of the Christchurch Arts Centre. The tower collapsed during the 22 February 2011 earthquake. A digger was used to clear the rubble away from the building. Scaffolding constructed around the tower has also collapsed and is amongst the rubble. In the background is a shipping container. A red sticker has been placed on the door to the Physics Building. 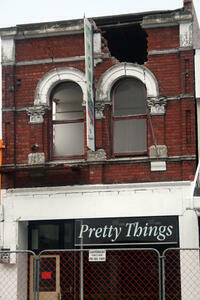 A photograph of Pretty Things on Colombo Street, with damage to the front wall and fencing around the building. A red sticker can be seen on the front door, indicating that the building is unsafe to enter. A photograph of the Thai Temple restaurant on the corner of Colombo and Peterborough Streets. A red sticker has been placed on the front door, indicating that the building is unsafe to enter. 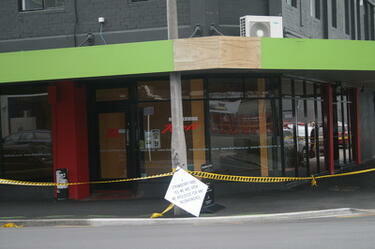 Tape has been placed around the building as a cordon. A sign reading, "Strawberry Fare, yes we are open, we are sorry for any inconvenience" has been tied to a lamp post in front. 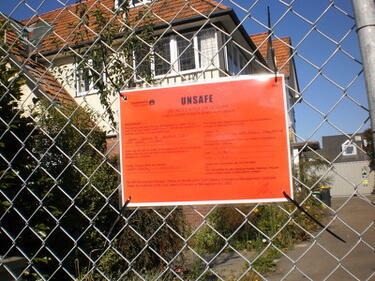 A photograph of a red sticker on the wire fencing outside a house on Papanui Street. The sticker indicates that the building is unsafe to enter. 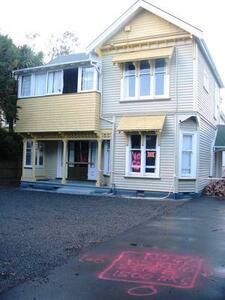 A photograph of a residential property in the Christchurch central city with USAR codes spray-painted on the driveway and "No go" spray-painted on the front window and door. A red sticker in the window indicates that the building is unsafe to enter. Cordon tape has been draped around the side, cordoning off a pile of bricks. 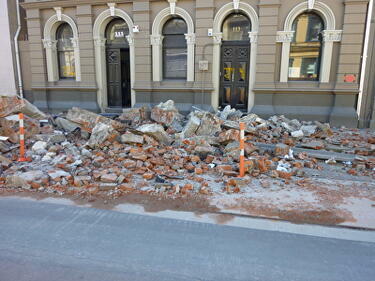 A photograph of bricks and other rubble on the footpath outside a building on Lichfield Street. 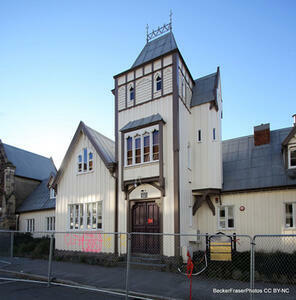 USAR codes have been spray-painted on one of the windows and the front door. A red sticker has been stuck to a column on the right, indicating that the building is unsafe to enter. A photograph of the entrance to the Brannigan's building on the corner of Gloucester Street and Oxford Terrace. 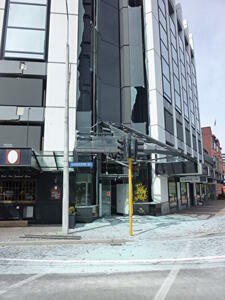 Many of the windows down the centre of the building have broken, and the glass has fallen onto the footpath below. USAR codes have been spray painted on one of the front windows. 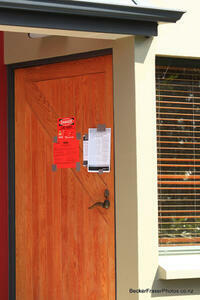 A red sticker in the door indicates that the building is unsafe to enter.